The Augustana College Library holds many treasures. 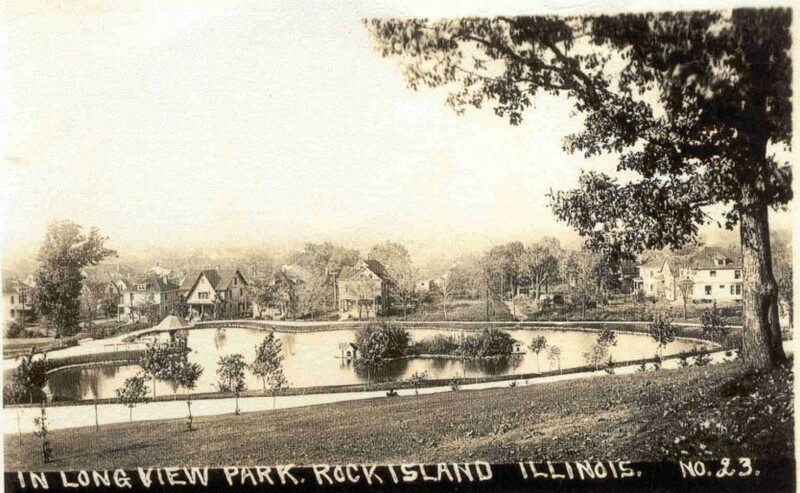 Among the postcards in their Special Collections are these two Real Photo shots of the lower lagoon – or lake as it was known then — at Rock Island’s Long View (later Longview) Park. The park developed on what had been Bailey Davenport’s pasture. Bailey, who lived in a spacious home near 15th Street and 8th Avenue, owned a swath of land extending up the hill in the center of Rock Island. After his death, his land was sold to a group of local businessmen who were then convinced by Mayor Medill to donate a part of their holdings to the city for a park. 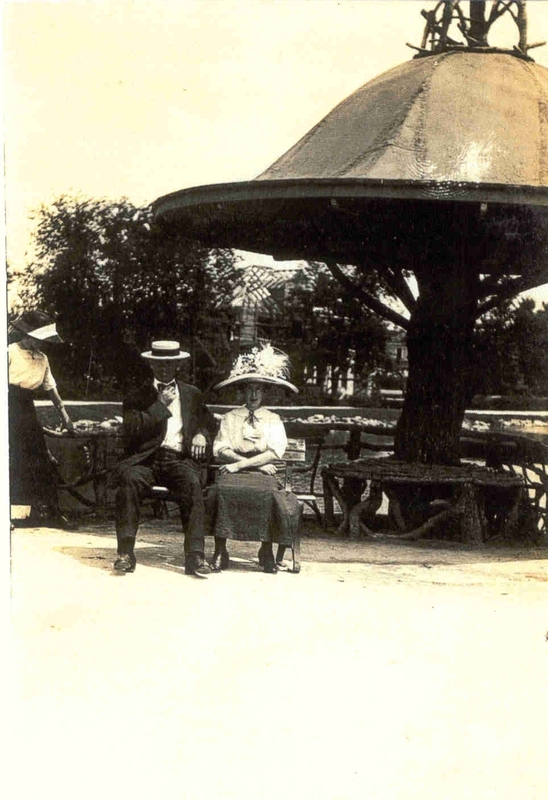 An association to develop the park was formed and Ossian Cole Simonds, a noted Chicago landscape designer was hired to convert the pasture to a park. Simonds had just graduated from the University of Michigan in 1878 as a civil engineer when he was hired to oversee implementation of architect William LeBaron Jenney’s designs for Chicago’s Graceland Cemetery. Simonds was named superintendent of Graceland in 1881 and would be actively involved there until his death in 1931. Long View Park was the epitome of Simonds’ artistry, with a winding drive, lagoons, dams and streams. The lagoon on this postcard, although now dry, is one of the significant remaining features of Simonds’ vision for this urban park. Notice the center “island jungle” intended to provide a shelter for imported Chinese geese. Water running down the hillside kept the large but shallow lagoon filled. Capturing rain runoff in this way is an idea that is once again considered important as stormwater management becomes an issue for our cities. Only four houses are shown on 13th Avenue opposite the lagoon. (The houses on the far right face 17th Street.) 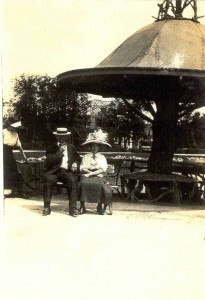 This dates the postcard to about 1908, the year Longview was dedicated. From this perspective, near the bottom of the present aquatic center, the lagoon looks nearly heart-shaped. It is a scene nearly identical to an earlier, often reproduced color postcard, which is not shown. However, the color postcard is slightly earlier because there is a tree at the top center of the “heart” where the wide view postcard shows a small bell-roofed shelter. The shelter is shown more clearly on today’s second postcard. The roof rafters visible in the background date this postcard to about 1915 when Walter and Marie Yerbury’s brick house at 1236 17th Street was under construction. Here it is apparent that the graceful roof of the shelter was made of metal sheets soldered together around the trunk of a dead tree – the tree in the color postcard. Other branches were artfully assembled to create a rustic bench beneath the tree, as well as a fence at the lagoon’s edge. We can’t help notice how the lady’s opulent hat, bedecked with feathers and blossoms, seems to echo the shape of the roof. That hat and the rest of her outfit would be drastically out of style only a few years later as hemlines rose and hats became pot-shaped cloches. The shelter, too, would disappear, probably when the dead tree rotted away. The lagoon however would survive many park remodelings, even holding water through the early 1970s. Although the Chinese geese were long gone, it was still a place of quiet natural repose – that is until the water froze and O.C. Simond’s lagoon area was filled with the laughter of ice skaters. In 2008, the Friends of Long View celebrated the 100th Anniversary of the park with a program and a history booklet. That booklet is still available in the kiosk at the downtown Rock Island Library and at City Hall. This article, by Diane Oestreich, is slightly modified from the original, which appeared in the Rock Island Argus and Moline Dispatch on January 6, 2008.